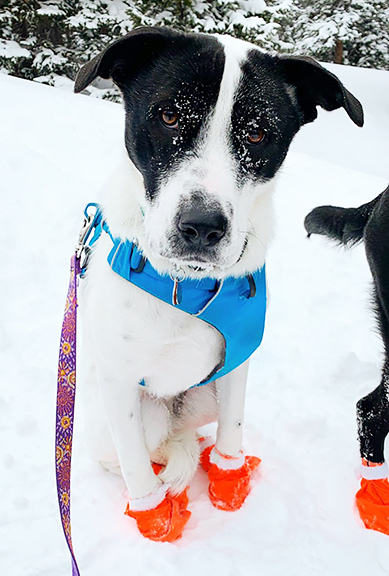 We have had a snowy couple of weeks around here. 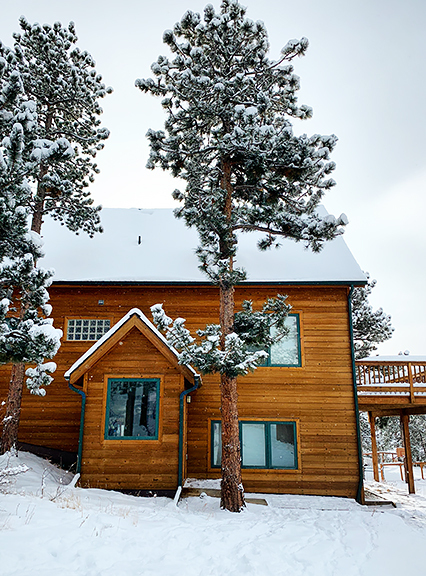 You know what I think of when I see the snow in my yard, in the surrounding mountains, and pretty much all over town? Well yes, I think of skiing, but I also think of mushrooms and berries come summer. It’s all about water in the American West. And snowpack. I can’t stress the importance of a healthy snowpack. Snowpack is everything in the mountains. 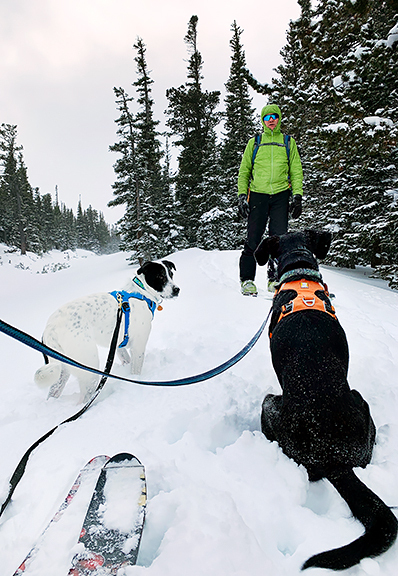 The pups have gotten out to ski a number of times. 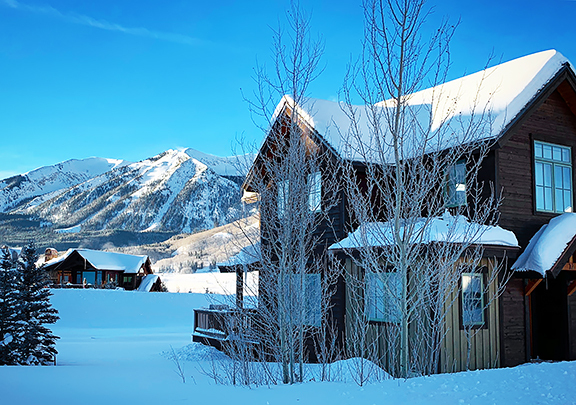 In Crested Butte it is mostly uphill skiing on the mountain or skijoring on the Nordic trails. In Nederland we take them backcountry touring which is far more dependent on weather conditions. You have to catch recently fallen snow before the winds reshape it into a series of giant drifts and bare ground. When I’m not skiing or working, I’m slowly chipping away at the long term task of tidying up the house. 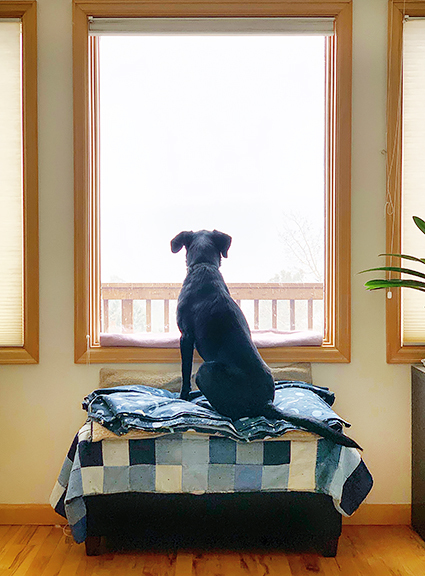 This activity wasn’t inspired by Marie Kondo – I have neither read her book nor watched her show. I simply like things to be organized. That included baking pies to finish off a few leftover fillings from the depths of the chest freezer: Palisade peach and sour cherry, and a handful of tired apples from the refrigerator. A reader recently emailed asking for recommendations and mentioned that they couldn’t wait to see what Chinese New Year recipe I would blog this year. Um, I hadn’t planned to share one and suddenly I wondered if I should try to shoot a recipe in time for the New Year (February 5th). But I only wondered for a second because the realist in me dope slapped myself and said, “You don’t have time to be shooting a recipe for free when you have a client shoot that pays ACTUAL MONEY.” So no, there is no Chinese New Year recipe. I’m not sure today’s recipe even counts as Chinese. 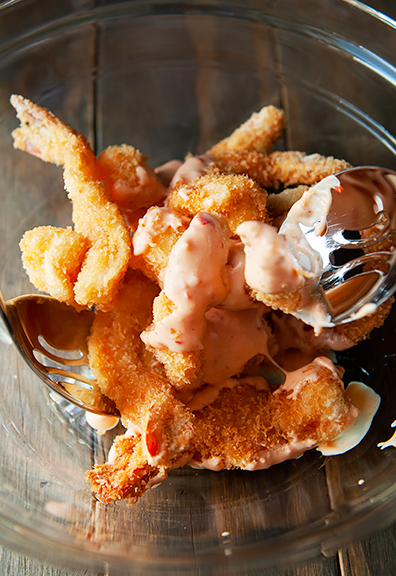 You can find Dynamo Shrimp on the appetizer menu at Lil’s in Crested Butte. It’s delicious and we’ve ordered it several times over the years. My friend replicated the recipe and shared it with me last year. 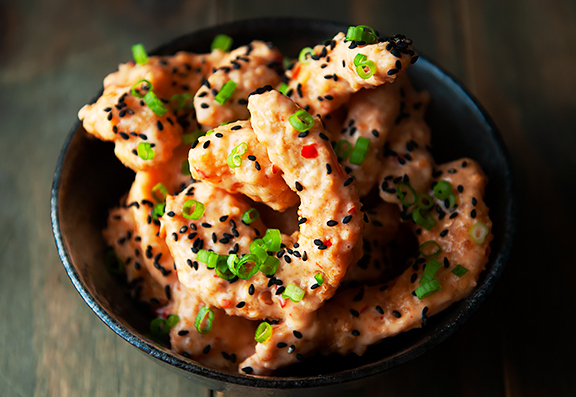 When I began researching the recipe, I discovered that it is a variation of Dynamite Shrimp from PF Chang’s – a restaurant I’ve only set foot in once, by accident. It seems more Americanized Japanese than Americanized Chinese. It’s Asian-y. 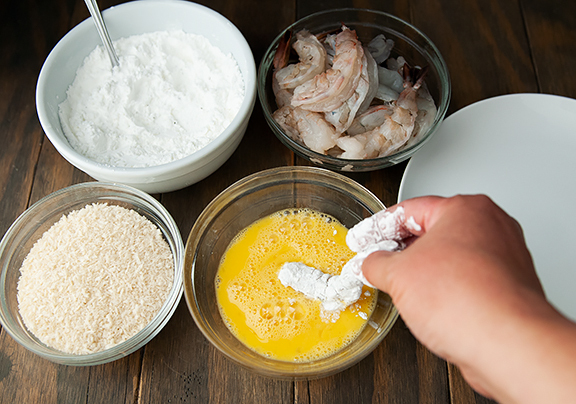 Start with the sauce, because you want it ready to go as soon as the shrimp are done. 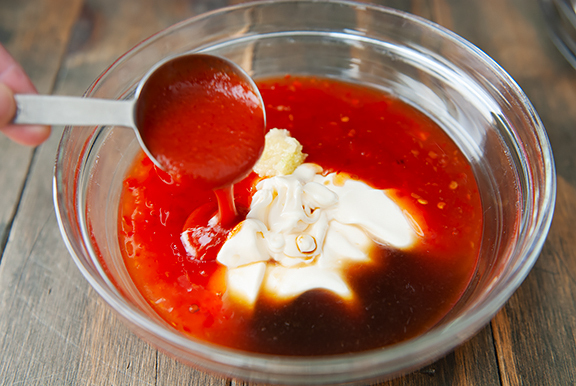 You’ll spend more time gathering the ingredients than making the actual sauce. I used a half cup of mayonnaise, but in the future I’ll reduce that to a quarter cup as I prefer to let the other ingredients stand out. 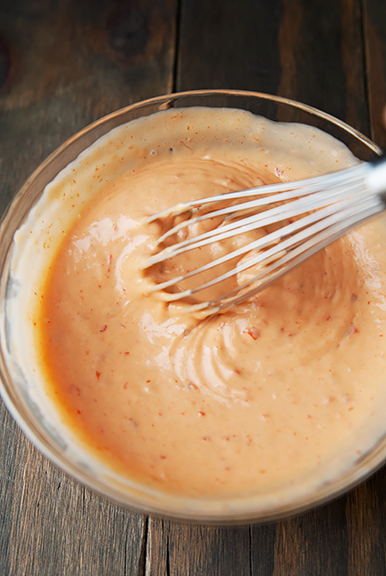 You can cover the sauce and refrigerate if you are making ahead. I think it should last a couple of days, no problem. As for the shrimp, you don’t HAVE to fry the shrimp. My friend has grilled the shrimp and served it with the sauce. I imagine sautéing or baking the shrimp would work, too. But none of these methods will achieve the crunchy exterior of frying. I chose to batter and panko the shrimp, but the restaurant (Lil’s) tempura fries their shrimp. Do what works for you. 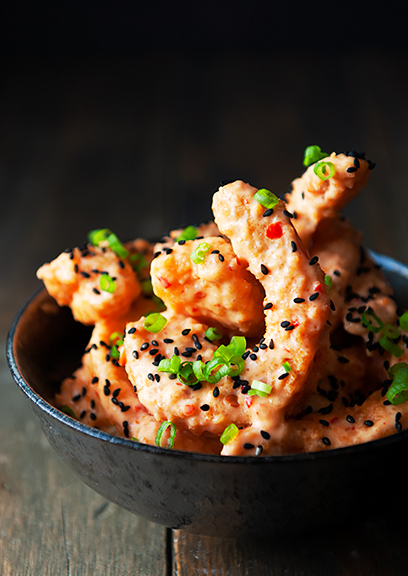 If you are making a pound (or more) of shrimp, it is best to fry them in batches. Overcrowding the pot with too many shrimp results in a steep drop in oil temperature and they won’t fry up nicely. After a couple of minutes in the hot oil, flip the shrimp and continue to fry until they are golden brown. Like I said, I prefer the sauce a little less mayonnaise-y, so I’d reduce the mayonnaise by half next time. But the dish itself is delicious because crisp fried seafood in spicy, tangy, sweet, umami sauce will never be a fail in my book. It doesn’t reheat well after mixing, so if you have made more than will be consumed, I suggest keeping the extra fried shrimp separate from the sauce. To enjoy it later, warm the extra shrimp in a moderate oven and toss with the remaining sauce. If you’re worried about Chinese New Year, I list my bare essentials: Eat dumplings (homemade, store-bought frozen, restaurant) on New Year’s Eve and New Year’s Day. Don’t eat squid or white tofu. Eat something sweet first thing on New Year’s Day and try not to cuss. Don’t buy salt for 2 weeks up to a month. Don’t clean house for 2 weeks. You’re all set. 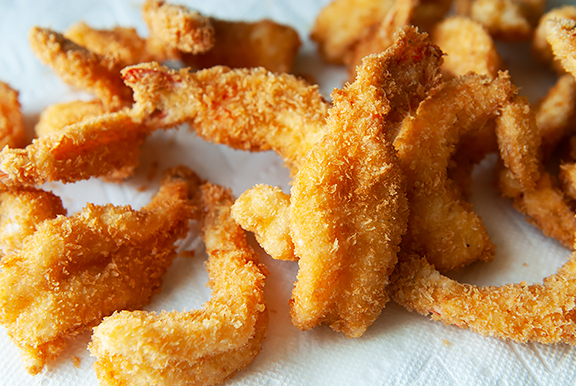 NOTE: You don’t have to fry the shrimp. 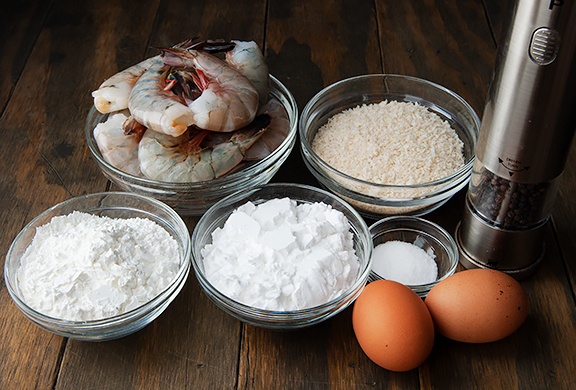 You can grill or sauté or bake the shrimp as you like and toss with the sauce. 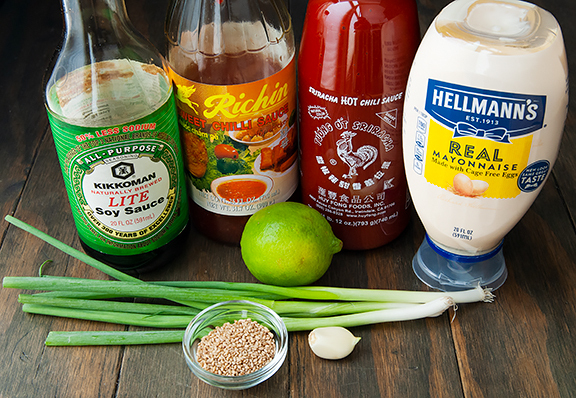 Prepare the sauce: Stir all of the ingredients together and set aside or cover and refrigerate until ready to use. Fry the shrimp: Heat 2-3 inches of vegetable oil in a large pot over medium high heat to 350°F. Stir the potato starch, cornstarch, salt, pepper, and cayenne together and sift into a wide bowl. Place the beaten eggs in a small wide bowl. Place the panko crumbs in a wide bowl. 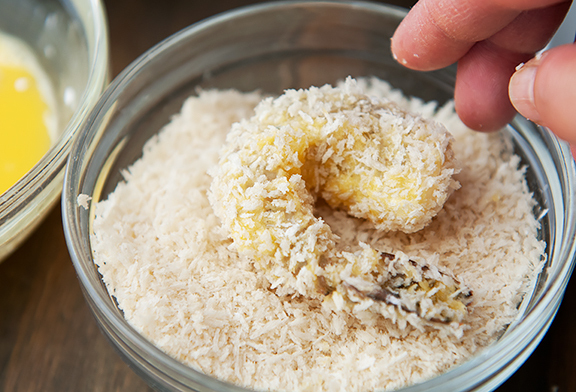 Dredge a shrimp through the potato starch mixture, then dip in egg, then roll in panko crumbs. Repeat for the rest of the shrimp. 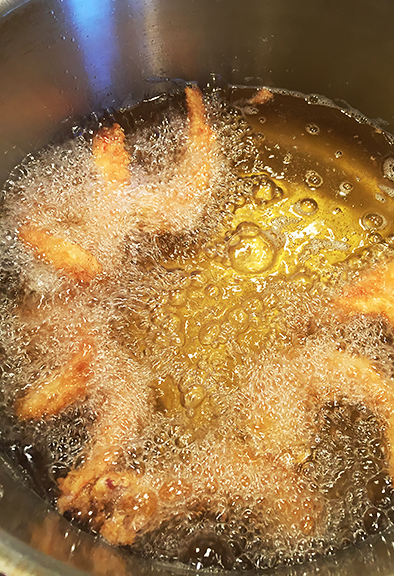 When the oil reaches temperature, fry the shrimp in batches, taking care not to overcrowd them in the oil. Flip the shrimp over after 2 minutes. Fry until the shrimp are golden brown, then remove to paper towels to drain. Continue to fry the rest of the shrimp in batches. Get ready to serve: In a large bowl, toss the shrimp and half of the sauce together. Add more sauce as desired. Garnish with sesame seeds and green onions. Serves 8. That pie? So beautiful – before and after! 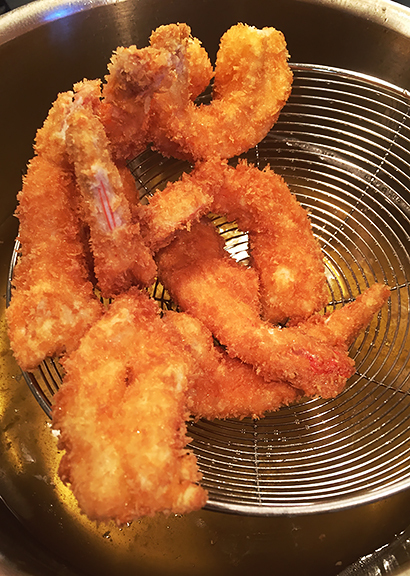 Oooh, I don’t like frying, but the one thing we do fry is shrimp for one particular recipe. I am definitely trying this one as soon as the girl child has an evening to come and enjoy it with us. It looks delicious!! Thanks for sharing! 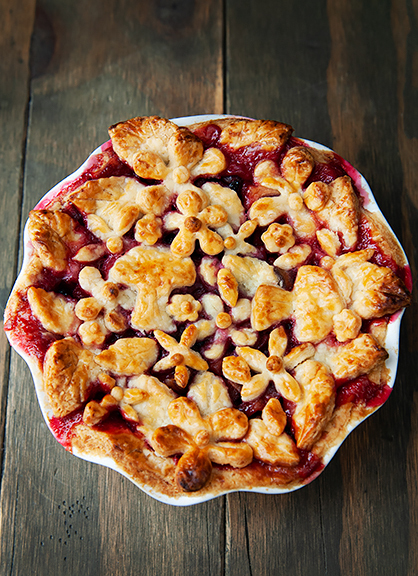 I love the artsy crust on your pie! The shrimp look delicious but I will probably not make them as I really don’t deep fry. But I might try imitating that beautiful pie. Do you have mini cookie cutters or did you do the lovely flowers, mushrooms, and leaves free hand? And if you do have the cutters where would one find them? Mmmm, we made this for dinner tonight, and it was excellent!! I didn’t re-read the post before making it, and tossed all of the shrimp with sauce. Fortunately we only have 10 shrimp left (doubled the recipe to make meal size portions instead of apps). I think we’ll reheat in the toaster oven and hopefully it will crisp up well enough. Thanks again! Berna – You are welcome! Jill – Ha, the only person who breaks the “no cleaning house for 2 weeks” rule is my mom – she LOVES cleaning the house. Jill from Detroit – You could always grill the shrimp and toss or dip in the sauce. My friend made it that way and it was delicious. 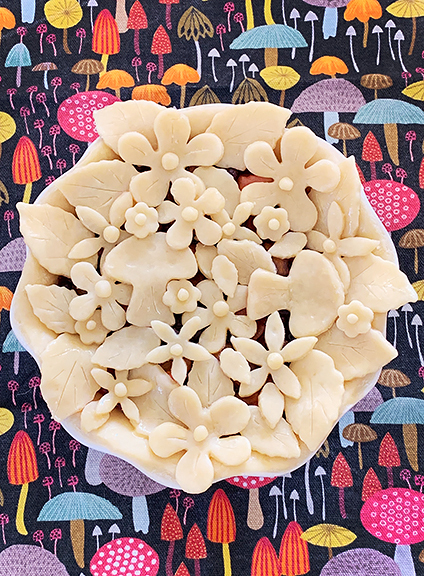 I do have several assortments of mini cookie cutters that I bought mainly for dog biscuits, but apparently come in handy for pie crust dough! Off the top of my head, Ateco and Fox Run make some nice sets. I can’t remember the brands of the others. I found mine at a local gourmet kitchen shop, but you can also find them online.